It's spring break y'all!! The Paud split up to take on different parts of Europe (or stay in Paris) and me and two other girls in the program took a little day trip to Lille. I got to take the train (possibly the highlight of the day??) which was a lot of fun. It was super fast and we got to Lille in about an hour. Our first stop was to find something to eat and we walked through Vieux Lille or Old Lille on our way to find food. I Lille-y loved Old Lille! We had plenty of options for lunch (all of which involved burgers ... is this a Lille delicacy?) and we decided on a cute little American-themed diner. We split these two burgers because we avo-couldn't decide on just one! Then, we walked (and took loads of photos) of the cute little Lille-ian houses and their cute colors! It was no Madrid, but lovely nonetheless. It felt like something out of a fairy tale! Our destination was the zoo, but we walked through the park and found that it was closed until April! I was really looking forward to the zoo, but the weather was beautiful so we walked around the park a bit more (saw lots of dogs!) and then walked back to Vieux Lille. Une petite promenade in a petit parc ! We flâner-ed (strolled, aka my new favorite french verb) in the rues until we came to Aux Merveilleux - a pastry shop I found while researching things to do in Lille. Their specialty are these meringue-type pastries that are so light and delicious! We popped by another Notre-Dame cathedral (this is number 4 folks!) and then did a little shopping. I think I'm officially out of cathedral puns .. (Notre) Damn it! We ended our little day in Lille with a mojito from a mojito bar (I found one with passion fruit so I was v contente). We sat on the steps in the center of town and listened to a band play some songs before hopping back on the train to Paris. Can never say mojit-no to a mojito! Friday was a relaxing morning, lounging around until I called my sister at around 2 on my walk. After, I heard back from my friend and we were all set to have an afternoon picnic, or pique nique! I wish I could take every call on a bridge in Paris! We got our baguettes and cheeses and wines and strawberries and eclaires (phew!) and set out for a cute park in the north end of Paris. Let me tell you it was perfection! I couldn't have asked for a nicer afternoon with good food and good friends! 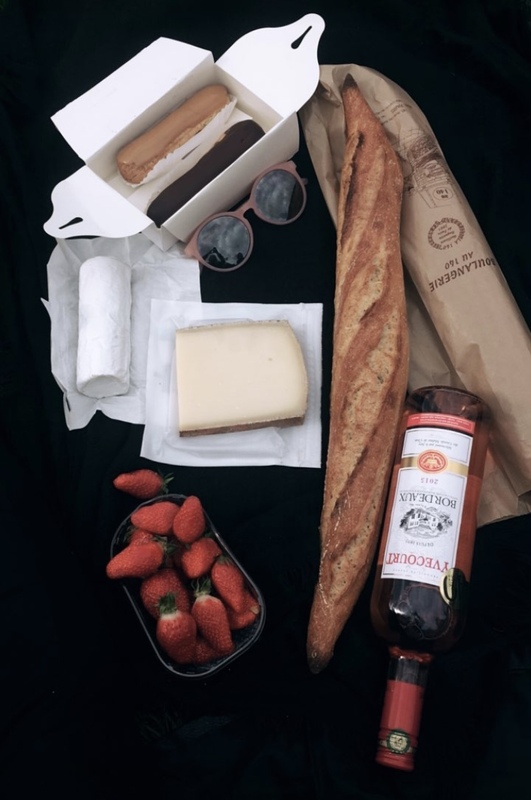 I'm so ready for the nice spring weather in Paris so we can have picnics all the time. Excuse the blurry photo - but not to worry, it was green cider! 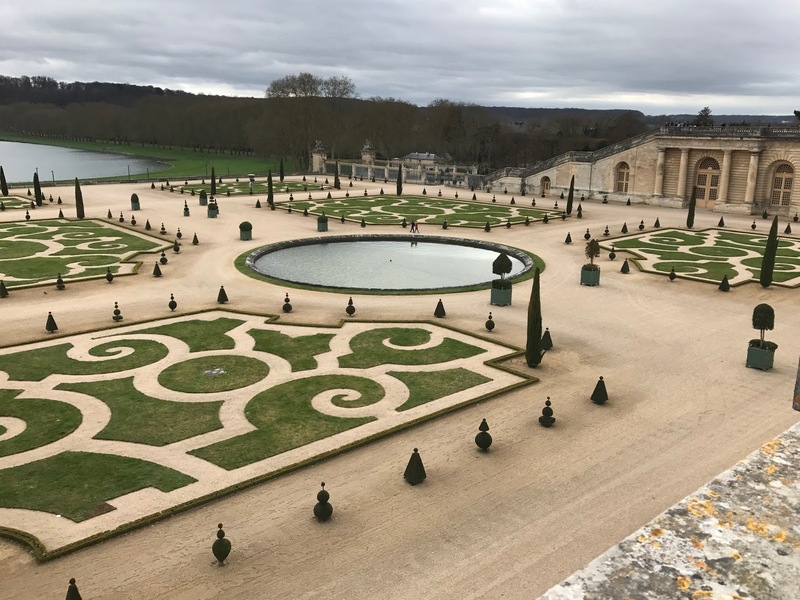 Saturday, my friend and I took another little trip to Versailles! Sadly it was a little gray and cloudy, but we still had a blast. 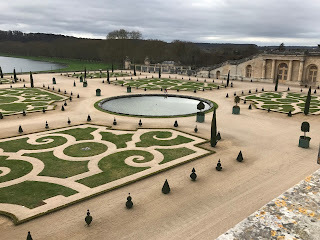 We took so many pictures in the castle and in the gardens and did a speedy walkthrough of the castle - note there are a ton of crowded tours on Saturday afternoons! Hall of mirrors - a girl needs to be able to check her 'do every moment of the day! A giant garden is going to def be on my bucket-list when I buy my future castle! Dinner was ramen with my friend and then grabbed some drinks at our go to bar - Everest! (5 euro cocktails - what more could you ask for?!) Grabbed a street crepe and then headed out to Bastille for a little night on the town! Nutella and Ore-oh no! What am I going to do when crepes aren't on every block? Sunday is going to be a chill day I think, I am going to take a little walk to scope out the fam's Air BnB area and maybe go to a café to do some work. This weekend in Paris was a little cloudy and drizzly, but I wouldn't have it any other way - the true Parisian lifestyle.